Things don’t always go to plan. When making any financial decision it is important that you consider the potential worst case scenarios, as well as the benefits of any product. This is particularly important when you are making a long term decision that also affects your home – such as equity release. We will therefore look at Sue and John who have taken Equity Release and subsequently have a number of unforeseen calamities hit them. The case studies below will show how their equity release loan and their obligations to it are impacted. a sudden emergency, house move, divorce and death. These are examples and not based on any actual case. Likewise, Sue and John are not a real couple – nobody could be that unlucky – could they ? !!! We first need to start with the Equity Release loan they decided on. Sue has just celebrated her 60th birthday, John is currently aged 63. The property is owned outright and is valued at £250,000. Based on Sue’s age (she is the youngest), the maximum loan they could have is £50,000. They want to celebrate Sue’s retirement with a new car and a long exotic holiday. They therefore decide to release £32,000. They also pre-agree a facility for the additional £20,000 to be drawn-down, if and when they should need it. They will only pay interest on the £20,000 from the time they draw this money. If they don’t draw it, then they don’t pay for it. After adding set-up costs of £500 to the loan, the initial equity release loan is agreed and their initial equity release debt stands at £32,500. Assuming the last surviving partner dies after 25 years, the compounded interest at 6.49% per annum on £32,500 means that the amount owed to the equity release company would be £146,899.57. 5 years after taking out the equity release loan, Sue and John return home to find that their central heating system has failed. This is simply wear and tear and therefore not covered on their insurance. They will need to replace their whole heating system including boiler, radiator, pipework etc. The cost is estimated at £20,000. Sue and John don’t have this amount in savings. Fortunately, as they didn’t take the full value available to them when they initially took out the equity release loan, they have the reserve of £20,000 that they can use. They decide to release the reserve fund from their equity release contract. This means that a further £20,000 is added to the original loan. The original loan now includes 5 years’ compounded (rolled up) interest. The new outstanding debt is now £61,768.03. Annual interest at 6.49% will continue to be charged and rolled up on this new outstanding debt. This obviously means that the amount that will need to be repaid to the equity release provider has substantially increased. When they bought Sue a new car, John decided to go for a far more luxurious and expensive model than they planned. To cover the extra cost they took a finance package. Unfortunately John had an accident in the car, which was his fault and when he wasn’t insured to drive it. The car is a write off, and there is still £7,000 worth of finance owing, no insurance pay-out and no car to hand back to reduce the debt. Furthermore the other driver’s insurance company has a legitimate claim of £20,000 against them. Sue is not very happy with John !! Sue and John have no realistic means of paying this debt. Even though they could make small regular payments it is likely that a large amount of capital will always be owing. The insurance company decide to take Sue and John to Court to get a judgement against them and place a charge on their property. The insurance company is successful. While this is far from ideal, the court judgement cannot force Sue and John to sell their home to repay the debt. Likewise the Equity Release debt always takes precedent. This means that Sue and John still have the security of their home until their death. On the death of the last surviving partner the house will be sold and the equity release company would receive their payment first. After this, the insurance company would be entitled to take their debt from the remaining balance. If there is not sufficient money to repay the charge in full then that is unfortunate for the insurance company. While Sue or John’s estate could be made to pay any shortfall, the debt cannot be passed on to their children or wider family. Any money left, after both the equity release lender and the court charges have been settled, can be passed on to Sue and John’s family or in accordance with their wishes. To keep the rest of this case study simple – if not realistic !! - we will assume that, before the charge was placed on the property, John received a small inheritance which enabled him to settle with the insurance company. The main purpose of this section is to demonstrate that if you incur significant other debts that place you in a difficult position, the equity release loan takes precedent and guarantees you the security of your roof above your head. Nevertheless Sue is still not happy with John ! They could sell their home, repay the outstanding equity release loan, and split the balance between them. John could stay in the property - the equity release loan may be transferred to his name only, this means that Sue now has no debt. While it may not be possible to make a financial settlement at the time of the divorce, Sue and John could agree for her lawyers to place a charge on the property, to be paid when the property is sold, and after the equity release load has been repaid. Sue could leave the home but choose to remain on the property deeds and therefore the equity release loan. This means that she would retain her full share of any equity after the equity release loan is repaid. While this option may suit Sue, it may cause longer term problems. If John dies before Sue, or is taken into long term care, then unless Sue moves back into the property, it must be sold to repay the equity release loan. Further complications can occur if either of them enters a long term relationship with another partner. After some long conversations, Sue and John decide to try to make the marriage work. Sue thinks a fresh start somewhere else would be good. Sue and John have a daughter who lives near to London. They think that moving closer to their daughter will be good for them as they get older, they will also be able to see more of their grandchildren. The value of Sue and John’s home is £275,000, with the equity release loan now standing at £100,000. This means they have equity of £175,000. Even though they are looking to downsize, given the location of their new home, they will need to spend at least £275,000 on a suitable home. 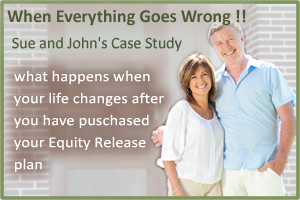 Sue and John are therefore worried that they can only buy to the value of their equity and not the value of their current property. They are worried that they won’t be able to move, as there are no suitable properties at £175,000. However the good news is they can buy for the full value of their existing property if they wish. After talking to their equity release adviser they learn that their loan is portable. This means that they can transfer the existing loan to the new property. In other words, they can buy for £275,000 and not £175,000. Just like their current home, the new property could be worth £275,000 with an equity release debt of £175,000. Sue and John move home and for many years they live happily and get the benefits of living close to their family. John is now aged 85 and his health has been in decline for some while. It has now got to the stage where he is unable to perform basic personal activities, such as washing or feeding himself. Even though they have carers visit, John now needs constant 24 hour attention. It has been decided that he needs to be taken into long term care. While this is undoubtedly a sad day for the family, both John and Sue have the peace of mind of knowing that Sue is secure in the home. 18 months after being taken into care, John dies. Sue lives for many years after John. Despite being happy in her home, the building of a high speed railway line, nuclear power station and an open prison close to her home has had a negative impact on her house value!! When Sue dies at age 95, her house is worth £250,000; this is £25,000 less than they originally paid for it. The rolled up debt on the equity release loan stands at close to £300,000. This debt / loss is borne by the equity release provider - it is not a debt on Sue’s estate, only the home. Likewise Sue’s daughter cannot be asked to pay back this difference. We recognise this is an extreme case study! Most people will not have to face all of the issues encountered by Sue and John, although some of them are inevitable. We have simply tried to put forward a number of difficult and stressful circumstances that can occur and demonstrate that Equity Release should be a safe product and your ability to live in your home cannot be affected by other issues. You will only leave the home if you want to, and the equity release product (if meeting the criteria of the Equity Release Code of Conduct) will not add to your burden or worries in these scenarios.